Just bought an ice cap ATO. Seemed everything was working fine but when I woke up the ATO alarm was sounding. It seems to me that the reason for the alarm is the fact that the water level in my sump is about an inch or more above the top sensor. If this is so then why is it filling to this level and what can I do to correct it? Safety level sensor (PS) is a backup to shut off the feed pump in case of a malfunction. In this case a red LED will flash and an audible alarm can be heard. As to the why.. well.. it would seem that the first sensor failed to see that the water had reached the proper level and the water continued to rise until it tripped the PS safety sensor..
Now that could be from a failure in the ATO or potentially you have a siphon issue with your pump..
Is the ATO container water level higher than your sumps return section? If so do you install the "siphon break" properly per the instructions? What exactly do you mean by “return section”? The water level in the ato is higher than the water level in the return section. I believe I installed the siphon correctly. It can only go two ways and I went by the picture on the box. And wouldn’t the fact that it filled so far above the safety sensor imply that neither sensor worked properly? How high is the ATO top off tube from the pump? If it is lower than the water level in the ATO it will syphon down to the level you have the tube output at. The tube output is definitely a few inches above the water level in the sump and definitely higher than the pump which is on the floor of the reservoir. 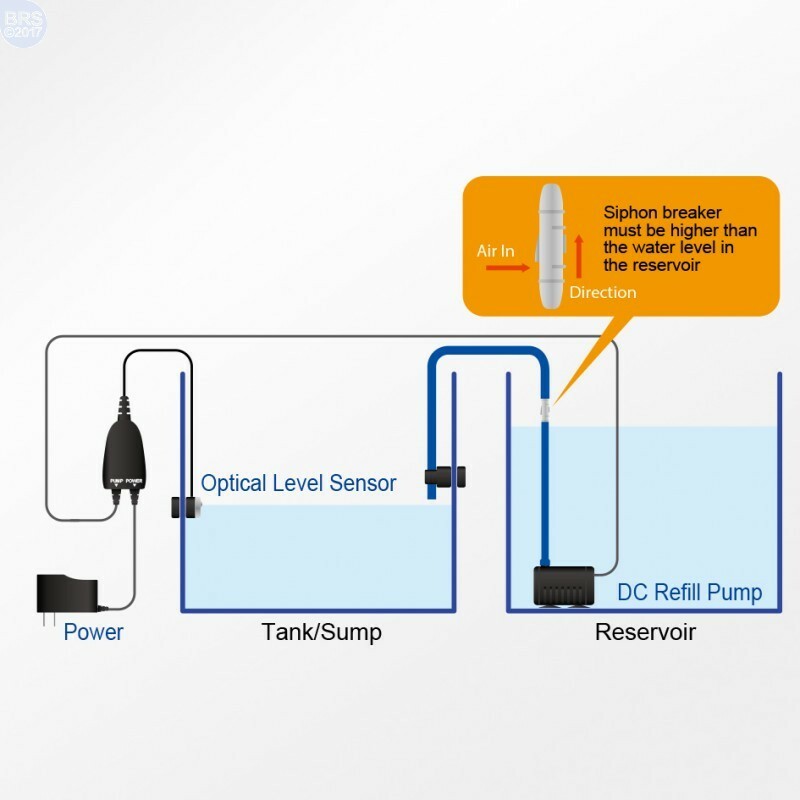 It sounds like you may have a siphon related issue and the sensors have alerted you but thats all that they can do for this type of situation..
Look at this diagram/article here..
As you see there if the water in the left tank is higher than the right tank and your tubing is like that diagram then the first time the ATO turned on and your pump started the siphon started.. The sensors may have stopped the pump but if the siphon of water which is now started and the water does not need a pump anymore to keep flowing kept going then the water will keep flowing until something breaks the siphon. Some pictures of your setup from the side showing heights and then how you have the siphon break installed may help..
That or you can physically test the ATO by lifting up the ato sensors to get the pump to start then ensure it stops (and so does the flow of water after the pump stops) with everything filled back up properly again.. Thanks Mac, I will read the article when I get home and if that doesn’t get me straight I will post a pic. Niether of these are what you want to worry about. The output of the tube or syphon break needs to be higher than the level of water in your top off container. Or it will syphon until it is. Thanks for diagram. I think I have everything set as it should be. Will post pic when I get home. I would not trust the diagram above. I have a 1/4" bulkhead fitting above the water line and my ATO pumps to said bulkhead. No need to worry about syphon, that valve gets clogged and you will have issues. Here is a pic of the setup. I marked the critical points. Sorry pic is crappy but best I could do. Turned it on when I got home, it immediately topped off to just above the top sensor, pump then shut off, no siphon activity, and then the alarm went off ? And was the water above the second "safety" sensor? or did it stop at the "correct" spot just shy of the first sensor.. It stopped just above the safety sensor. No where in the thread did I read if the pump is running or not while this happens. If the pump is running and not shutting off when the water hits the first sensor, bad first sensor or ATO control unit. I would first unplug the sensors from the unit and the unit from the wall, then plug every thing back in. Lapin- yes the pump is running and the water flow stops when the pump shuts off. I will try to unplug and see how things work afterwards. Smokey- you’re saying I should use no siphon break at all? A few people have mentioned siphon issues but I haven’t noticed any at all. Water has only flowed when the pump is running. It could be that you have set it up incorrectly thus leading to this problem..
Was the normal level sensor above the water level when you mounted it/set it up? I'd assume there is some calibration process where it looks at the sensor and it must be above the water or whatever initially then you lower it down or something..
Read the manual and try to set it up again..
Maybe you even have it upside down..
Just saying "I" don't. Have you tried Coral Vue tech support? If you have a situation/application where its not needed then there is no need to use it.. But if you do then use it..plain and simple..
Its quite easy to understand the concepts behind a siphon to know if one will form or not.. There are also certain types of pumps where you would not need one even if a siphon is "possible".. Like a peristaltic pump.. But if you are using a normal centrifugal pump or a diaphragm pump like the toms aqualifter and you have a situation where a siphon can develop then use it..
Its just not possible to have an application/pump,etc.. that will allow a siphon and to not have one.. It will happen every time so I'm not sure where smokey is going here.. If he doesn't need one.. he doesn't need one.. That doesn't mean you don't..
Was just trying to help, Once a siphon has started water will seek its own level, Right? So if the end of the fill hose is below the water level in the resevoir it will continue to flow and you would need some kind of break. I/my ATO system does not have or need a fitting inline. (still wouldn't trust one not to clog)The end of the hose is higher than the high/full level of the resevoir so siphoning does not continue after pump stops. However, I re-read the OP and he said it's not a siphon issue. He should check that all his wires are plugged into the correct ports maybe. Then give CoralVue a call. I’m not going to pretend to completely understand everything about the siphon effect but isn’t it safe to assume that since no water is flowing after the pump shuts off that siphoning is not the problem? Yes.. For the most part if the ATO triggers the pump to turn off and the water stops flowing then a siphon is not the issue..
Unplugged the unit, waited a minute, plugged it back in. Then pump shut off, water stopped flowing, and alarm began to sound. I checked the installation and everything is connected properly, without question.